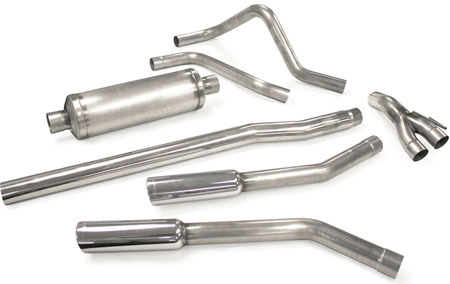 The JBA Cat-back Exhaust System features a mandrel bent stainless steel construction for an optimal flow, as well as premium quality stainless steel. These materials provide for an unrestricted airflow which unleashes more power along with a distinctive JBA sound. The stainless steel tubing is mandrel-bent meaning, it has no crimps and the surface is ultra-smooth to maximize airflow. The cat-back system will never rust, and is backed by JBA's lifetime warranty. Gain power and a throaty exhaust note with a JBA Cat-back Exhaust System. Will NOT fit 04 F-150 Heritage Ed.